Click to buy tickets here. This ticket entitles you to One Meal and One Beverage (a $13-$15 value) at CoreLife Eatery in Henrietta on Sunday, April 7th, 2019 from 5-7pm ONLY. Proceeds of this fundraiser benefit the Genesee Dietetic Association. Once you purchase your ticket you will be provided with a download link to print your ticket. Please be sure to print your ticket, write your order number one it, and bring it with you to the event. You will find your order number on the checkout page, as well as the confirmation email sent to you. *Valid Only At Location: 100 Marketplace Dr #520, Rochester, NY 14623 during date and time listed. On Saturday, 02/09/2019 from 1:00pm – 3:00pm at ALEX AND ANI® Rochester, 15% of the total proceeds from this time will be donated to Genesee Dietetic Association. We would love for you to visit ALEX AND ANI Rochester during this time, but if you are busy or out of the area, you could give your order and payment to someone who is able to come in during the event. If you would like to browse what is available, you can visit www.alexandani.com. Please see the below paragraph for exclusions. Promotional items, discounted items, gift cards, CHARITY BY DESIGN®, Affinity licensed products, and items from the LIBERTY COPPER® Collection will not be included in the total sales of the event. However, there are still plenty of pieces to choose from! While you are browsing online, please keep in mind that some collections that are still online have been discontinued and are no longer available in stores. Please feel free to call the store at 585-730-8124 if you are wondering if what you have selected will count toward our event- we will be more than happy to let you know if what you have chosen will count toward the event and if we still have it in stock! The Wegmans School of Health & Nutrition at RIT is excited to offer a new course, Global Health & Nutrition Perspectives this coming spring, 2019 at both the graduate and undergraduate level. Join us for a wine pairing dinner while Toby Amidor presents on “”Meal Prepping: Time-Saving Techniques for Simple, Delicious and Well-Balanced Meals and Snacks”. Live cooking demonstration will be done on Toby’s favorite easy prep meals from her Book “The Healthy Meal Prep Cookbook”. Foodlink’s Cooking Matters program is in need of volunteers! Foodlink is Rochester’s regional food bank serving a total of 10 counties. Foodlink goes way beyond traditional food banking, however! Foodlink operates a mobile farmers market called Curbside Market, has a team of 9 full time Nutrition Educators, and even runs an urban farm. Foodlink is dedicated to finding creative ways to address the root causes of food insecurity in Rochester and beyond. Cooking Matters is a hands on nutrition, cooking, and food budgeting program through Share Our Strengths. There are courses for kids, teens, adults, and families! Each course lasts for 6 weeks and has a 2-hour long weekly class where participants learn about basic nutrition and cooking skills through fun activities and delicious recipes! We need volunteers to serve in one of three roles: Nutrition Educator, Chef Educator, and General Assistant. Volunteers do not need to have formal training in culinary arts, for example, to serve as the Chef Educator (though it is welcomed)! We ask that volunteers come to each of the 6 classes and arrive 30 minutes before class to set up and stay 30 minutes after class to clean. Volunteers are also asked to attend a “zero class meeting” that is held the week before the first class. We also need volunteers for special events! We also do several single day programs including in-store nutrition education events at major grocery stores. All volunteers must attend a 2 hour long training at Foodlink. Once you submit an application, you will be invited to our next training! Once you’ve completed a Volunteer Application form and attended a training, you will receive updates about all courses and special events that we are holding and will be free to sign up for as many as you’d like! The RIT Research Spotlights: Health & Life Sciences Committee would like to invite you to the third annual Research Spotlight: Health and Life Sciences event at Rochester Institute of Technology on April 4th, 2018 at 6 PM in the B. Thomas Golisano Hall, Room 1400. This is an event that celebrates graduate and undergraduate students in their endeavors to understand and improve health and life sciences. Each student will demonstrate their work and conclusions via five-minute consecutive visual presentations. If you are interested in joining us at this event, please follow this link and RSVP by March 28th. Click to add this event to your calendar. 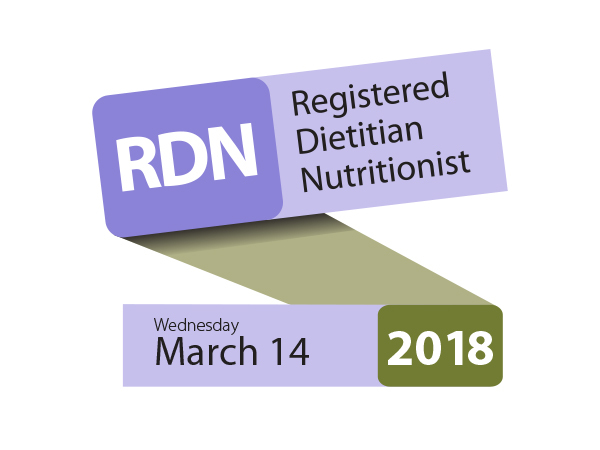 In 2018, the Academy of Nutrition and Dietetics celebrates Registered Dietitian Nutritionist Day on Wednesday, March 14. The Genesee Dietetic Association is proud to be providing a free RD Day Celebration on Wednesday March 14th to celebrate all of our members and hard working registered dietitian nutritionist in and around the Rochester Area. We will be celebrating on Wednesday March 14th from 5:30-7:30pm at The Strathallan in Rochester. The address is 550 East Ave, Rochester, NY 14607. Refreshments will be provided and a cash bar will be available. We will also be offing raffle basket prizes as a fundraising opportunity for our membership. Grab a friend and please stop by to celebrate with your colleagues! And a special thanks to Abbott for sponsoring this event! If you are already a current member of the Genesee Dietetic Association, you can log into your account using the form here. If you are not yet a member, but would like to be, please click here to find out how you can Become a Member.